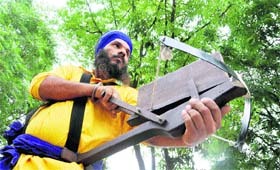 The performance of Sukhdev Singh amazed spectators as he came on stage with innovative ‘Sikh war tool’ that shoots 12 arrows without loading it again. A disciple of Baba Banda Singh Bahadur Gatka Akhara, Sukhdev was taking part in the first district-level ‘gatka’ competition at Guru Nanak Dev Engineering College. Seven teams from various ‘akharas’ took part. He targeted a cardboard placed at a distance of around 20 metres and hisd plastic arrows knocked the board as effectively as a bullet. wooooooooooooooooooooooooooooooow! I love sikh history!!!!!!!!!!!!!!!!!!!!!!!!!! !